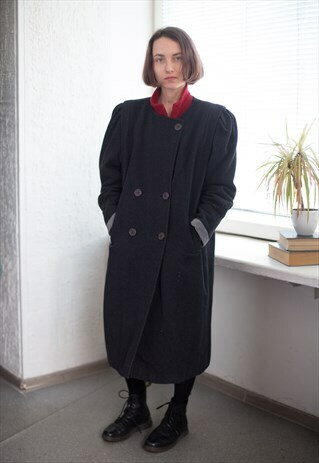 Vintage 80's wool puff sleeved no collar coat in grey with two side pockets. 70% wool, 30% polyester. UK size written 16S, but looks flexible like 10-14. Model size on the photo is 8. Measurements: length 43.5 inches, sleeve 24.5 inches, chest 50 inches, waist 50 inches, hips 48 inches.